Is Samsung About to Get Samsunged? A vertically integrated South Korean conglomerate with an extensive supplier relationship with Apple has ambitious hopes in the smartphone market. The company will aggressively imitate the products of rivals in the pursuit of success, and also further integrate additional key components, such as investing more heavily in its own mobile processors. Pencil's down. The correct answer? LG Electronics. That's right; LG is in the process of doing to Samsung what Samsung did to Apple. LG has just unveiled a new "Value Pack" of software upgrades for its Optimus G Pro, and some of the features that the company is adding are straight out of Samsung's playbook. LG's Smart Video pauses videos when the user looks away, an obvious carbon copy of Samsung's Smart Pause. There's also the Dual Camera feature, which simultaneously takes pictures using both sensors, and is exactly like Samsung's Dual Shot. This is all for a device that already looks identical to Samsung's Galaxy Note 2 (except without the stylus). Galaxy Note 2 (left) vs. Optimus G Pro (right). Sources: Samsung and LG. The Optimus G Pro was unveiled at Mobile World Congress in February, so it technically predates the Galaxy S4 that it also resembles. The 5.5-inch phablet isn't expected to launch in the U.S. until May, though, which comes after the Galaxy S4. The bad news for Samsung is that there's little stopping LG from successfully using its own strategy against it. One of the benefits of enormous marketing budgets, however, is that Samsung has been able to build its Galaxy brand. While smaller rivals like HTC simply can't keep up with Samsung's marketing budget (even if HTC offers higher-quality products), larger competitors such as LG have more of a chance. Last year, LG spent $1.1 billion on advertising. When you add in other below-the-line marketing expenses like promotions ($652 million) and commissions ($1.6 billion), we're talking about more than $3.3 billion in marketing. That's more than the $1 billion that Apple spent in fiscal 2012 (but less than Samsung) on advertising ,and Apple doesn't really use below-the-line marketing as much. The Mac maker doesn't typically offer very many promotions, and most of its sales are conducted through its online store or retail stores, where sales reps aren't compensated with commissions. Android consumers have shown their fickleness before. It seems like just yesterday that HTC was the Android champion, but that was 2010. Even for users loyal to the platform, they're normally not loyal to the OEM brand. It's quite conceivable that another Android vendor could supplant Samsung in exactly the same way that Samsung displaced HTC. Maybe it won't be LG; maybe it'll be Chinese vendors like ZTE or Huawei, both of which showed up on the global top-five radar last year. This may be more likely, since LG still doesn't rank in the top five, although it ranks No. 5 in the U.S. with 6.8% of domesticsmartphone subscribers. The whole reason Samsung has been trying to undermineGoogle Android lately in the first place is in an effort to differentiate itself and fend off commoditization, which reduces the chances that fellow Android enlistees will steal its crown. If any vendor is going to topple Samsung, chances are it'll be another Android OEM. 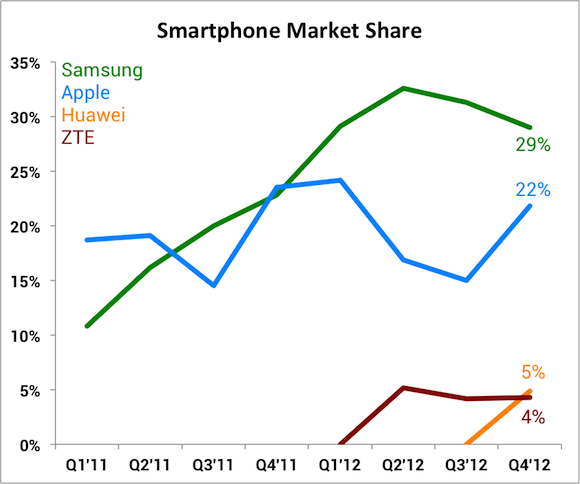 So long as it all contributes to Android ubiquity, don't expect much preference out of Big G as to who wins. In fact, the search giant already isn't particularly comfortable with Samsung's dominance anyway. While Android OEMs face inevitable commoditization, Apple's highly integrated strategy lends to inherent differentiation and dramatically higher loyalty among users. The company's iOS platform lacks the fragmentation that plagues Android, which is how the iPhone and iPad businesses are able to generate healthy recurring revenue streams. Apple has plenty of other opportunities, which The Motley Fool details in our new premium Apple research service. Get started by clicking here. The article Is Samsung About to Get Samsunged? originally appeared on Fool.com.